When I was a kid, up through about my late teens, I played an awful lot of pencil & paper RPGs. It started with Dungeons & Dragons, of course. A friend had the Basic Set – the “red box” that was the genesis of so many geeks – but we quickly outgrew that and went looking for more. It was followed by AD&D, then Car Wars, Call of Cthulhu, Twilight 2000, Traveller, Gamma World, Rolemaster, Champions, Top Secret, and on and on and on. These all needed dice. A lot of dice. Now, the hobby shops sold really nice dice, but I was pretty broke, so I made do with the dice out of introductory sets, and dice scavenged from old boardgames, and the occasional die from the hobby shop when I was feeling rich, and I kept them all in a Crown Royal bag that more-or-less epitomized the Height Of Cool as a teenager. 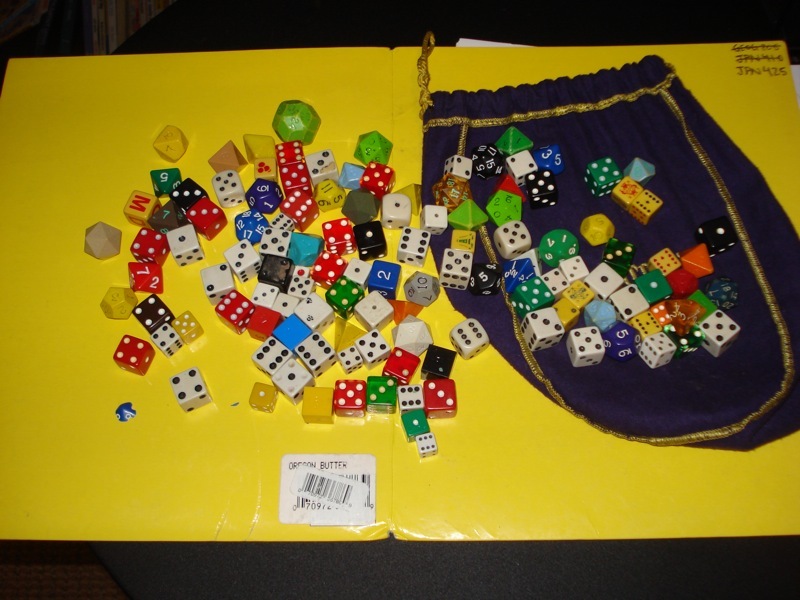 I still have that bag, and the dice. Eventually I discovered girls other hobbies, sold most of my gaming books and stuck the bag ‘o dice into a box, and in general left the world of pencil & paper RPGs completely behind. So it’s rather odd to find myself part of a gaming group once again. It’s a good bunch of people – my wife and myself, another couple about our age, a friend from school and her husband, and two teenage boys. One of the teenage boys keeps his dice in a Crown Royal bag. It made me feel all warm inside to see it. 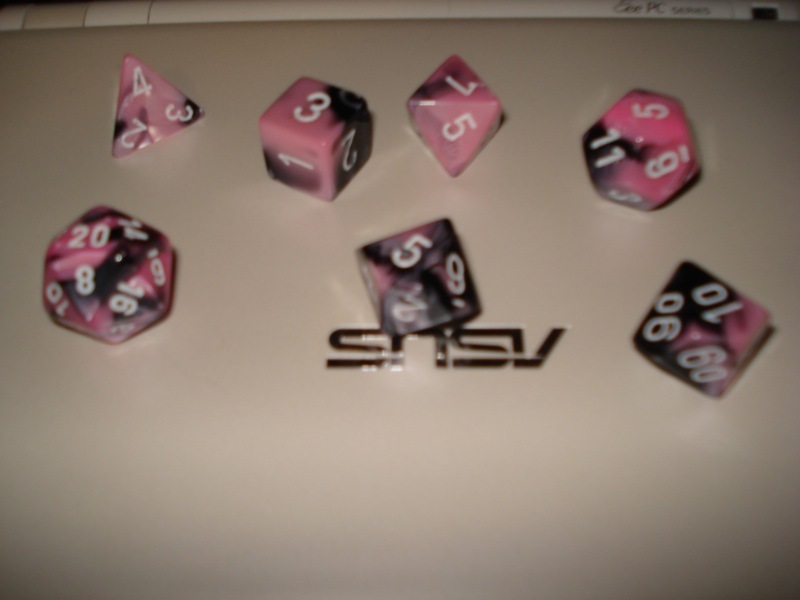 Anyway, being an adult, I can finally afford to have a nice set of matching dice. I actually thought about getting metal dice, but I realized that most of the gaming takes place around a glass-topped table and that I didn’t want to go accidentally chipping my host’s furniture, so I settled for “pretty”. Being old: It has advantages.